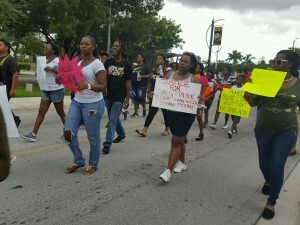 Black Lives Matter Alliance Broward is taking action in downtown Fort Lauderdale and Pompano Beach on Tuesday evening, September 13th, to demand justice for the killing of Gregory Frazier and to demand the newly re-elected State Attorney, Mike Satz, take greater action against killer cops in Broward County. The Pompano Beach community is taking their grievances over the unjustified killing of Gregory Frazier to the Pompano Beach City Commission meeting Tuesday night. Community members have already been coming to the Pompano Beach Commission in the past to demand far greater accountability from BSO, and for a review of Pompano’s contract with BSO before it is renewed later this fall. Pompano Beach City Commission begins at 6pm Tuesday at 100 W Atlantic Blvd. #blm954 will also be at Broward County Courthouse in downtown Fort Lauderdale at 5:30 pm on Tuesday. Mike Satz, in office since 1976 as the State Attorney for the Broward County area, has only indicted 1 officer for the shooting death of a civilian in the last 40 years, and he narrowly won re-election at the end of August. The Alliance has been campaigning for Satz to do more to prosecute killer and unaccountable cops in the area, particularly when it comes to Broward Sheriff’s office. Although we’re stuck with Satz for another 4 years, we’re not giving up that easily and will be continuing to demand that his office take the appeal against Jermaine McBean’s killer seriously, and for more investigations and prosecutions against killer cops occur. We’ll also be bringing the Pompano community’s demands for justice for Gregory Frazier to the State Attorney’s office.